Two recent missions trip experiences have left me thinking about attitude and heart posture. This story starts in the Mozambican city of Tete in 2017. In Mozambique, most places we visit lack running water, restrooms, etc. But Mozambicans understand the need for hygiene, so the custom is to offer a pitcher of water and a basin to wash your hands. The water is usually warmed over an open fire. Before any meal, when you enter a home, or even sometimes when you enter a village, someone approaches you with the pitcher and basin to wash your hands. They slowly pour the (warm) water over your hands and catch the runoff in the basin. Maybe there is a towel, or a woman might offer the edge of her capulana, but usually you air dry. Since there are no napkins and food is often eaten with your hands in Mozambican culture, someone comes around again after the meal with the pitcher and basin. This is a custom I was very used to. But when we visited the city of Tete for the first time there was a twist. It wasn’t until the Lord spoke those words that I began to notice the attitude in which they approached each person with the water. They had such joy. They would even jostle with each other just a bit over who would get to do it. Youth and leaders, women and men all took their turn at serving one another and us. It was all in the posture of their hearts. The people of Tete understood serving and servanthood at a level I have not often seen. It was humbling to be the recipient of such care, as well as to return the favor. 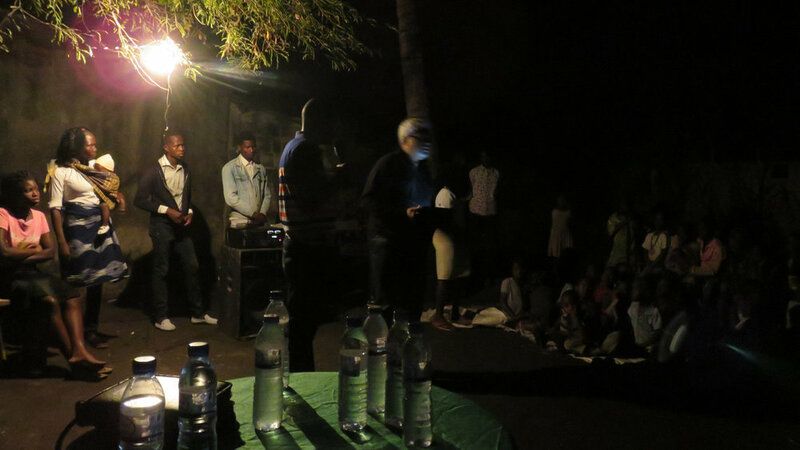 The second experience came in 2018 in the Manga region of Beria, Mozambique. We went to visit a church we had not seen since 2014. In the time between visits, this church had lost their pastor and their borrowed building. I wondered what we would find. The specified meeting location was inaccessible by vehicle when we arrived that Monday night, so we parked some distance from the church and walked the rest of the way in. As we approached where the church was gathering, we noticed it was just an open field, an empty lot. They didn’t even have a mango tree to meet under, just the starry sky. But at least fifty people gathered together that Monday night. They were so excited we had come to visit they laid their capulanas on the ground for us to walk on as we entered the empty lot. This church had no chairs, no building. Nothing but people. One strung-up, flickering light bulb lit the front of the lot. This church had no chairs, no building. Nothing but people. One strung-up, flickering light bulb lit the front of the lot. They invited us to sit on some rickety wooden chairs they had borrowed. The young man who was now the pastor was also the worship leader, but his guitar was missing strings and the bridge. They had also borrowed a keyboard and a couple of speakers just because we were coming. They started to worship, someone playing the keyboard and the pastor singing. The power abruptly went out. The single light bulb darkened and the keyboard went silent. But they cheered wildly and just started to sing a different song. We began to weep. That was some of the sweetest, most pure worship I have ever been a part of. I have some video I shot before we lost the electricity, and I have watched it several times since. It still moves me. This church had no building, no chairs, no sound equipment of their own, and a young pastor. But they knew Jesus. In the dark, outside sitting on the ground, they knew how to worship Him. It was again their attitude and posture of heart that hit me. In the church here in the U.S. do we know what it is to serve? Are we willing to serve on our knees washing hands? Do we know what worship is? Can we worship if we don’t have a comfortable building and the best instruments and sound equipment? Oh Lord give me their attitude and posture of heart.